Having won three Champions League in a row, Real Madrid were eliminated in the round of 16 at the hands of Ajax. This obviously didn’t go down well, at least with the Spanish media, who are busy reporting who will be Los Blancos’ next manager. They shouldn’t be blamed, especially considering the number of managers Real have had in the last two decades. 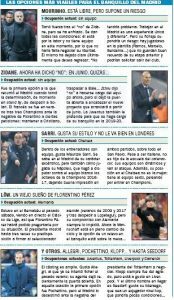 Saturday’s edition of AS takes a look at ‘most viable’ options for the La Liga giants and one of them on the list is Maurizo Sarri, who joined Chelsea last summer. It’s claimed the 13-time European champions are aware of the Italian’s ‘eccentric character’, but they really like the brand of football he plays. In the 2016/17 season, Real Madrid faced Sarri’s former club Napoli and the former were left with a good impression from the current Blues manager. AS also points out that Sarri is not one of those Italian managers whose tactical plan has a strong emphasis on defence, but prefers to play dynamic and attacking football. Chelsea are currently sixth in the Premier League with 56 points after 28 games, trailing fourth place Manchester United by two points with a game in hand. Sarri’s situation at the west London club was uncertain in February, but things have started to settle down since the start of this month. However, that hasn’t stopped him being identified as one of the managerial candidates for Real Madrid.